As the ongoing news series on Kollam tragedy surfaces, Incredible India is not all that it’s cracked up to be, especially our living temples. It is a matter of national shame that despite more and more fire accidents, there is no national or state level policy that addresses this goof up as such. Given the agitation and persuasion from the people’s side to host the “Kambam” calling it a tradition, there is no doubt that temple festivals have wound their way out of all legal, political and moral conundrums to become a law unto themselves. It annoys me when an incident as this is described as a ‘Tragedy’ when it’s actually a ‘fallout’ of unwarranted deeds and the repetitive nature of temple festivals and accidents. Considerable suspension of disbelief I required to come to terms with the affected lot calling “Kambam” a tradition that can’t be banned. Fatalistic Indian!! Or is it his thought process orbicular that life’s inequalities tend to follow him around! The past few days have shown just how difficult it is for the Kerala government to put up with the fire tragedy and confront the challenges. Though the discomforts with banning fireworks have been visible for a long time now and especially after the clamor for a blanket ban grew louder, it’s ridiculous that the government is still unprepared for the starkness with which a wise choice should be articulated. The choice is actually quite simple for the government: Ban the production and sale of fireworks or review the regulations and measures of The Explosive rules, 2008 to limit the sale of fireworks thereby include necessary prohibitions on the importation, sale, possession and use of fireworks in public places or places of worship even late at night. If the government is concerned that a ban could lead to an unregulated black market in illegal fireworks, then they should be at least working on the enforcement of the existing measures. For now, the spectacle is shocking. Once again, highly regarded people have proved themselves to be wholesomely susceptible to breaching the law. Have they been agile in harnessing connections and influence to dodge punishment is yet to be seen and heard. The disaster will have to be closely watched for signs whether people behind this horrendous tragedy will enjoy immunity from the law. And for those who believe that worship places holds life’s codes, it’s another sad reminder that rules often don’t carry beyond some boundaries. If fireworks aka the noise and dirt are loved and enjoyed then we need to have a tough approach on firework regulations. Come festivals and there is nothing that would prevent us from enjoying the bursting and cracking like there is no tomorrow. But the visuals of the kollam tragedy are so disturbing, making people rethink about how relevant is a firework display and more so a competition. According to estimates, in the last 50 plus years, there have been more than 400 such accidents in Kerala which conveys that the government didn’t care to enforce tougher rules and thereby create a controlled environment for selling, possessing or igniting fireworks. Learning of the impact, it’s anybody’s assumption that our country’s crackdown on fireworks is not yet as tough as the rules laid out by the Petroleum and Explosives Safety Organization of the central government. Temples in Kerala seem to be the most disaster prone areas given the stories of fires, stampedes and elephants running amok to the deafening sounds of the loudspeakers and heart thumping bursts of crackers. The louder and grandeur the show sans a reality check, the more divinity seems be the idea which ultimately claims a lot of lives about which the state government doesn’t care. As of today, a huge black market for banned illegal fireworks and related products seem to thrive in spite of the history of accidents getting repeated. Yet, even in the midst of a bloody disaster, we ignore the lessons of history at our own peril. It’s difficult to define Kerala’s enduring appeal for fireworks during temple festivities. Surprisingly enough, the temple authorities in determining the purpose of the visual treat didn’t really care to rewind one of the sobering reminders. Religion to them above all signifies rites and their ‘Kambam’ performance, I guess. Perhaps the fact that there’s something loud and bright for everyone has something to do with it. Minus a ban, we are in dire need of professional fireworks operators and breaking rules isn’t fun all the time. The government would also do well to draw quick lessons from the ‘Kambam’ episode to evolve a tough mechanism by which devotees are spared from death in worship places. 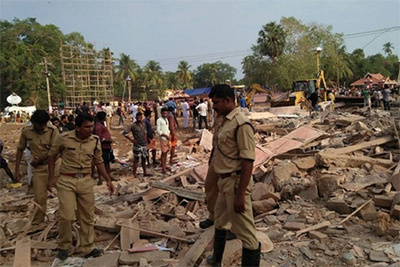 Therefore, despite the loss, anxiety, uncertainty and tension caused by this accident, the good news is that certain sections of the society are doing their best to advocate that temples are places of worship only and not “Kambam”. For people who don’t learn from mistakes, too much gloom, doom and analysis is of course bad for their souls. A certain happy-hearted fizz to celebrations seems to be must and if fireworks, even banned ones are part of the act, they will sure gear up, for Indians always look for a silver lining in a cloud. Besides, even if the government formulate an absolute foolproof solution for a safe “Kambam”, there is no telling if it will be executed given the devotees unfortunate stories of courageous but doomed firework adventure.